Shelton parks his rented Kia Sorento at the corner of 37th Street and D Place, less than a 10-minute drive from his family’s apartment in Auburn, Washington. He won’t go any farther north near the cul-de-sac where it happened. “I haven’t been back there since,” he says. May 1, 2011, was a Sunday. Shelton and his family hadn’t been out of church long when his older brother Shennon, who went by Skeevie, got a call from their oldest brother Tui’s girlfriend. In a nearby apartment complex, a fight had escalated throughout the day.1 An argument between two 13-year-olds had intensified to include their families and others. Tui, then 23, had been recording the scuffles with his phone when he’d been pulled into the fray and punched in the back of the head before fending off three men. Tui’s face was cut and bloodied, and he’d called his girlfriend, urging her to tell his brothers to meet him nearby. Soon, five men — Skeevie, Danny, their youngest brother Kevin, a cousin, and another friend — approached the apartment of Olenthis Woods, the older brother of one of the 13-year-old boys. Woods was one of the men who’d jumped Tui. Danny moved to the left side of the house. Through a window, he could see Woods carrying a gun as he walked toward the front door. He called out to his brothers, who didn’t budge. The first shot hit Tui in the chest. A second shot hit Shennon in the head, behind the ear. By then, Shelton was in front of the house, with a chair in his right hand. Woods raised the gun but didn’t fire. It was jammed. After throwing the chair, Shelton was able to wrestle the gun from Woods before pulling him to the ground. Gun in hand, Shelton hit Woods in the face repeatedly as Woods’s sister and mother yanked at Shelton’s hair and pepper-sprayed his face. He says he let up only when his right biceps seized, allowing Woods to shake free. “My whole body was covered with blood,” Shelton says. “The guy’s blood and my brother’s blood, because we carried him to the curb. I went home, washed all the blood and pepper spray from my eyes, and went to the hospital.” Paramedics said Shennon had died before reaching the hospital. The bullet lodged in Tui’s chest was too deep to remove, but after surgery he would eventually recover. All summer, Shelton felt lost. On prom night, a few drinks deep, he insisted he and his friends walk to his brother’s grave, a miles-long trip. Graduation brought a similar ache. Moments came when he didn’t know whether he even wanted to come to Washington. The heart of Greek Row at Washington is about three blocks from The Ave, the main drag near campus that makes this stretch of Seattle look like any college town. Near the intersection of 47th Street and 17th Avenue, a half dozen fraternity houses are crammed into just a few blocks. It was a familiar corner for Shelton his first year at school. “This is where we started all our nights,” he says as he drives by. Plenty of freshmen spend their time drinking beer and chasing girls, but for Shelton, it went beyond enjoying newfound freedom. He was trying to fill a void. “That was a way for me to let off steam, to let off emotions and stuff,” he says. “After [my brother] passed away, I just started going through this rage.” The night before a game that season, he even tried sneaking a female student into the team hotel. He was punished, but not to the extent that other players might have been. This fuse was shorter, but one had always been there. Shelton’s family moved often when he was young. His three older siblings were born in American Samoa, where his mother had met his father, a visiting Peruvian fisherman. Shelton was born in Sacramento and spent some time in Tacoma before the family settled in Auburn, about 30 minutes southeast of Seattle, with his uncle. All the shuffling was an attempt to get away from Shelton’s father, who regularly abused his mother. “There were times when we had three families in one house,” Shelton’s brother Tui says, sitting in the living room of his mother’s apartment. When an ignorant stranger asks to see Shelton’s room, he and Tui nearly double over. “This is it!” Shelton says, pointing to one of the few couches he and his brothers didn’t break as kids. Across town, just outside the gate of Shelton’s high school football stadium, is a small park. It was a place for family parties and church dance rehearsals, but it was also the scene for after-school fights. Shelton answered almost any taunt with violence. He shoplifted — nothing of value, just a stray candy bar here and there. It was a family thing. He doesn’t remember much about his father — the older man left for good when Shelton was 11 and died a few years later — but he can recall trips to Toys R Us when he was 5 or 6. Shelton would pick out a small item, an action figure or toy car, before his father would slip it under his jacket and head toward the exit. Moni meant companionship at a time when Shelton admits he was lonely, but she was also a means to create structure. He was responsible for another life, and he had to build his own around those obligations. “You really have to sit down and fix your schedule,” he says. The next fall, Shelton moved into a studio apartment alone. The move helped free his roommates from worrying about what a pit bull puppy does to furniture, but it also helped slow Shelton’s life down even more. He was drinking less, studying more. “Basically,” he says, “I was adding more responsibility so I didn’t have to go out and party.” Around the same time, he met a young woman named Mara Mariano while at the mall with his family. She was working at Juicy Couture before starting dental school. When Shelton and his family left the store, he lied about going to look for a hat before ducking back in and asking for her phone number. “I took a chance,” he says, “and it worked out for me.” The pair soon got another dog, a husky fittingly named Juicy. As a sophomore, Shelton started every game at nose tackle, but he felt that his junior season could be different. Then, in Washington’s season opener against Boise State, he suffered a sprained shoulder that he’d play with all season. He didn’t miss a game, but his play lagged. The Huskies finished the regular season 8-4, but the day after their 27-17 win over Washington State in the Apple Cup, players started noticing rumblings on Twitter that Sarkisian was headed to USC. The initial reaction, from Shelton and some of the other rising seniors, was deflation. “I got to the point where I didn’t want to play football anymore,” Shelton says. 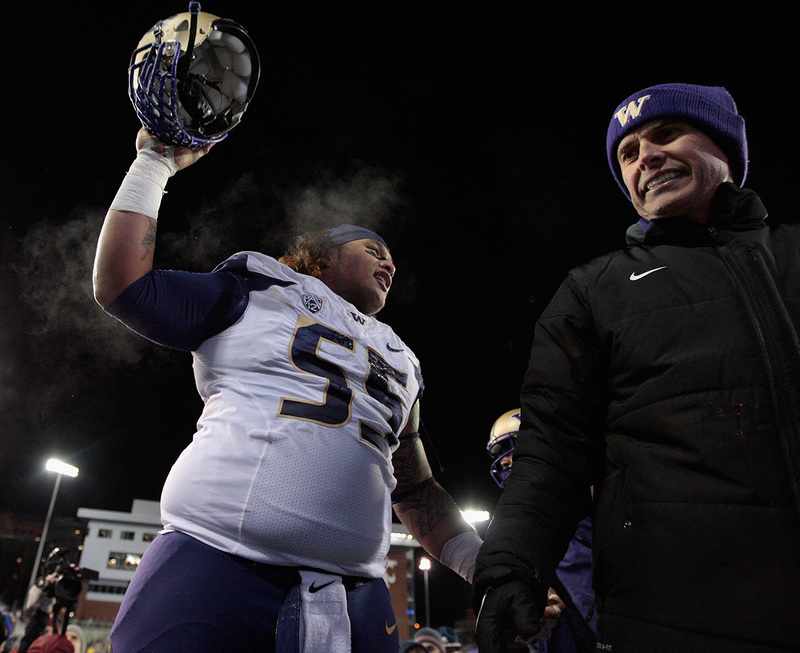 Within the week, though, resolve returned to him and the other seniors, and behind interim coach Marques Tuiasosopo, Washington won its bowl game against BYU. The arrival of new coach Chris Petersen meant starting anew, not just for Washington’s program but also for Shelton, with a coaching staff who’d only heard rumors about how difficult he could be. Justin Wilcox, the defensive coordinator for Sarkisian, had previously held the same title under Petersen at Boise State. Jeff Choate, who was arriving at Washington as the defensive line coach, was also on Petersen’s Boise State staff, and Wilcox and Choate had actually vacationed together that summer. Shelton was a frequent topic of conversation. Wilcox told Choate about Shelton’s boiling point, about the importance of bringing him back from the edge. In the back room of the Burke Museum of Natural History and Culture, near the main entrance to Washington’s campus, sits a staging area with a gray backdrop flanked by two high-quality LiteDome photographic lighting canopies. Today’s mystery is a woven, straw-colored sheet with tiny oval holes and a stitch of red across its length. Barker — she of the yipping ban — is an anthropology professor and the curator of Asian Pacific artifacts at the museum, and she guesses it’s about 80 years old. “I’ve never seen these designs before,” Shelton says. “With these holes, you probably couldn’t wear it as a garment.” One guess is that it’s ornamental, to be placed over a casket. Another is that it’s actually from Fiji. Of the 50,000 objects in the back rooms of the Burke, not all can be traced to a single island. There are 88 sets of shelves in these back rooms, each with at least 13 rows and four columns. Units 5 and 6 are where Shelton spends most of his time when he visits, among the Polynesian artifacts. That’s also the row with the first of two walls full of spears. “They used to joke that if there were a zombie apocalypse, this is where you’d want to be,” Barker says. Shelton took his first class with Barker, a cultural exploration of the atomic bomb, as a freshman. By now, he’s taken five more as part of his anthropology major. In the same row as the spears sit the kavas, wooden dishes propped up by legs that surround their circumference. There’s one tattooed on Shelton’s left forearm, along with a crossed chief’s fly whisk and talking stick, two more items used in Samoan ceremonies. “I would just come back here and see if I could find a connection [to my past],” Shelton says. He and other anthropology and ethnology students would spend hours in the back, sifting through items and learning what they could from them. As an intern at the museum, he helped to redesign a Pacific Islander exhibit. Barker and the staff made him a joke Burke Nerd certificate after he was named first-team academic All-American. Shelton admits that reconnecting to his lineage was just another way of rebuilding a part of who he is. 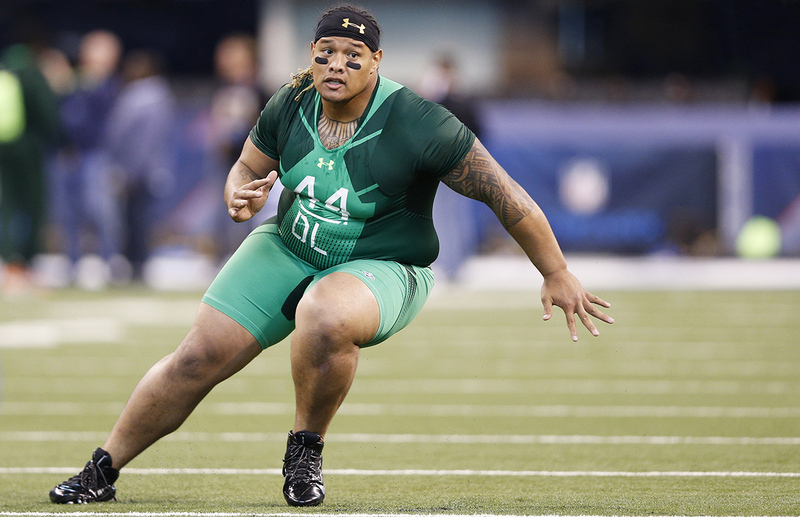 Away from football at Washington, he tried to be more of a Polynesian and a mentor with a 3.7 GPA than an athlete. This fall, he led a First-Year Interest Group on campus, helping mentor incoming students about the difficulties of the transition to college. He’s the first athlete Barker can remember asking to be involved with the program. Early on, when students would ask if he played football, he would lie. “I’d tell them I played tennis,” Shelton says. A few said he should give football a try. He told them he’d think about it. It’s just after 6 p.m. on a Wednesday, and most of Shelton’s family — his sister, his mother, a few cousins — have gathered in a room of the Church of Nazarene in Auburn for a Bible study led by his uncle. Shelton pops in to greet them, but not much more. As he leaves, a few kids in the lobby ask if he plays football. He tells them the truth. They ask if he’s a running back, and he smiles. The site they chose for Skeevie was purposeful. All the way up the hill, there’s a perfect view of Mount Rainier in the distance, and a clear look below at all of Auburn. “We saw it as a way for him to feel connected with us still, for him to be able to watch over us,” Shelton says. The sun is setting behind a row of trees in the distance, but there’s still enough light for the gold and purple balloons left from Easter to shimmer. Despite the chill, Shelton wears only a white Washington T-shirt with his name and no. 55 on the back. It was Skeevie’s high school number. Shelton grabbed it at Washington as soon as he could. Picking his school was a collective effort for the Sheltons, and recruiting trips remain some of his favorite memories with his brothers. “I could always see them smiling all the time,” he says. “It was more for them than it was for me.” He feels the same way today. “What makes me happy about this is knowing my family is happy and enjoying the process with me,” he says. “That’s exactly how my brother was, too. My brother was all about the family, all about making sure we were having a good time. He exhales. By now, the sun is almost behind the trees. Shelton and his size-15 sandals begin shuffling toward the car. Even as darkness creeps in, the balloons glimmer. According to this Auburn Reporter story, which was based on a release from the Auburn Police Department.